THE provincial team of the Highway Patrol Group in Negros Oriental is urging the public to heed the law prohibiting small children from riding on board motorcycles. Senior Inspector Silvestre Cenia, Jr., head of the Provincial Highway Patrol Team (PHPT) on Thursday, February 21, explained that this is in line with Republic Act (RA) 10666 or An Act Providing For The Safety Of Children Aboard Motorcycles. “Balaod na gud na, mao nga kinahanglan nga musubay ang katawhan ani (it is already a law and therefore the people should heed it),” he said, citing the Implementing Rules and Regulations (IRR) of RA 10666 earlier signed by Department of Transportation Secretary Arthur Tugade and Land Transportation Office Assistant Secretary Edgar C. Galvante. The IRR has stipulated that only children who can reach or rest his or her feet on the standard foot peg of a motorcycle, can reach around and grasp the waist of the motorcycle driver, and is wearing a standard protective head gear or helmet are allowed on board a motorcycle. 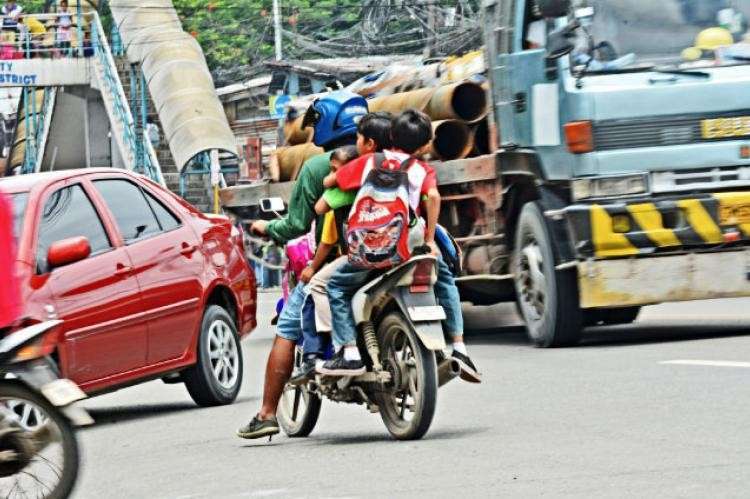 Under the said law, it is unlawful for a motorcycle driver to have a child on board in areas where there is heavy volume of traffic and high density of fast-moving vehicles. Cenia said the PHPT has been implementing this since the IRR was released in 2017, but due to limited number of personnel, they can only do so much. He noted that there are only four of them assigned to the PHPT and yet they cover the entire province of Negros Oriental.